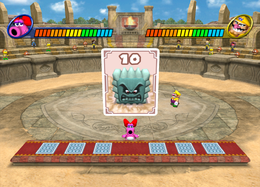 Cardiators is a Duel minigame that appears in the game Mario Party 8. Its name is a portmanteau of "card" and "gladiators". The Wii Remote is held sideways for this minigame. The two players enter a gladiator-like stadium from gated entranceways opposite of each other. Both players face each other in the middle of the stadium, and the game begins. In the middle of the stadium appear three face down cards, each with a number from one to three. Both players choose a card, each of which has a number. The player with the highest number goes first. Both players now compete in an RPG-style card battle. Both players have the same amount of Health Points (20). A set of cards is displayed facedown on a nearby table. Each player has ten seconds to pick a card before whatever card he or she happens to be standing in front of is automatically picked for them. The card the player picks has a character (such as a Penguin or a Thwomp) and a number. The character on the card then comes charging in and attacks the opponent, taking away HP. The amount of HP taken corresponds to the number on the card. The best card that one can get is worth is the "12" (which has the Chain Chomp), while the worst is the "1" (which is the Penguin) and "2" (which is the Ukiki). After the first player is done attacking, the opposing player then goes to the cards, grabs one, and attacks their opponent. This process goes on until one of the players runs out of HP and loses the game. Penguin 1 A Penguin attacks by sliding into the player. Ukiki 2 An Ukiki jumps and land on the player's head. Bob-omb 5 A Bob-omb explodes in the player's hands. Three Ukikis 6 Three Ukikis move towards the player and consecutively jump on the head. Seven Penguins 7 Seven Penguins run over the player. Wiggler 8 A Wiggler enters, red with rage, and runs at the player. Bullet Bills 9 Three Bullet Bills fly towards the player. Thwomp 10 A Thwomp falls and flattens the player. Chain Chomp 12 A Chain Chomp enters and flings the player into the air. This is the most powerful card of all. The camera zooms in on the winning player, who stands behind the table of cards and does his or her victory pose as the losing player remains sitting on the ground behind him or her, still dazed from the last attack. Rules – "Take turns selecting cards that launch attacks on your rival. Reduce your rival's life meter to zero to win!" Hint – "There's no way to know what a card will do until you've selected it. Good luck!" This page was last edited on February 12, 2018, at 17:02.